Did thunderstorms wake you up? A band of rainfall related to a disorganized tropical disturbance moving into South Texas blew through the Houston region this morning, bringing heavy rains and some really loud thunder cracks. This band has weakened now, but a few more storms will rotate through the area today before the westward moving system clears the area. After this we will see mercifully waning rain chances for awhile. Looking at the radar, a mass of storms associated with the tropical disturbance can be seen moving steadily westward. However, Houston will remain on the northeastern periphery of the disturbance today, so we can expect to see more showers rotate through. Right now we don’t anticipate anything too extreme, but areas that pick up 1 to 2 inches of rain in an hour can probably expect to see some street flooding, which is most likely for areas between downtown Houston and the coast, and southwest of the city. The National Weather Service has a flash flood watch in place for coastal counties that expires at Noon today. They may extend it through this evening as a precaution. We can probably expect the heaviest rains to die down by this afternoon or this evening. The main body of the tropical disturbance will push west of the Houston metro area on Saturday, and accordingly rain chances will be best to the southwest of Houston, nearer to the disturbance. 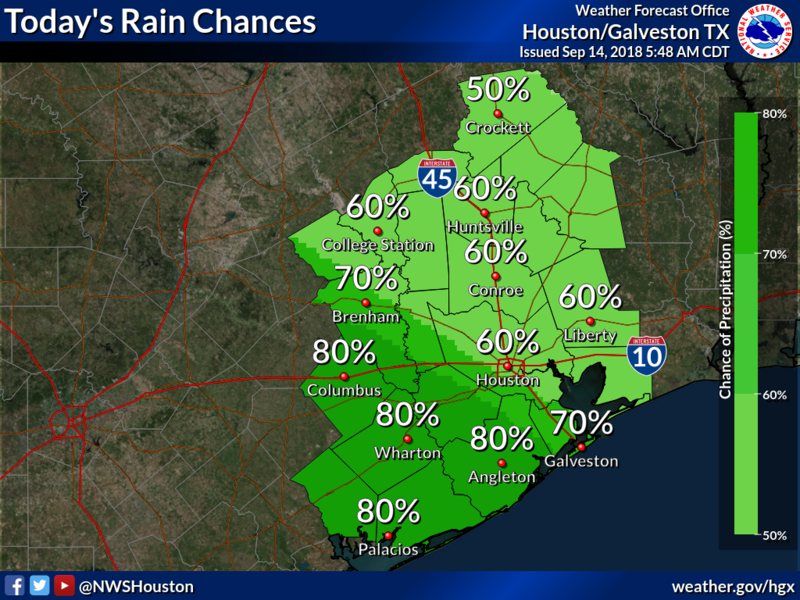 However, atmospheric moisture levels will remain quite high across the area, so we may see some short-lived showers and thunderstorms in Houston itself. If you have outdoor plans, you might be OK—just don’t expect too much sunshine and have a plan to duck out of any storms that pop up. I think this will probably be a nice day. We can’t entirely rule out some scattered showers and thunderstorms, but for the most part we can expect partly sunny skies with highs of around 90 degrees. This late-summer like pattern will prevail, with highs of around 90, and the possibility of some afternoon showers and thunderstorms. We don’t anticipate anything too extreme, so this should be a good chance for the region to dry out. Wondering about Isaac? We’ve had countless questions about the former hurricane, which became a tropical storm, which now is a depression. It is probably going to become an open wave. After that time, it most likely will plow into Central America. However, there is a chance it could regenerate and move into the Gulf of Mexico next week. Do we think Texas is a realistic threat? Not really. Are we watching it? Sure. It is mid-September, after all. Should you be concerned? Not right now, and probably never will you have to be. Isaac: Not really worth worrying about. As for that first cold front, I know we’re all eagerly awaiting that. Unfortunately, I don’t see that much of a chance for one during the next 10 days. During the last week of the month, however, chances for that appear to increase. Hopefully, by early next week, we’ll have a better sense of when things might cool down—just a bit—for the Bayou City. Can you explain how Florence as a cat 3 had a pressure much higher than cat 3’s in the gulf? The Saffir-Simpson Hurricane Wind scale rates hurricane strength based on wind speed alone. Cat 1 – 5 ratings depend on a wind speed of 74 mph on the low end of Category 1 to above 157 mph for the very strong Category 5 storms. The barometric pressure of the storm used to be used in the calculation of the storm category, but that changed to just a purely wind-driven scale in 2009 (which means Ike’s category did include it’s pressure). Having said that (and keep in mind, I’m no weather guy), I would guess that Florence has a well-defined and high pressure at the eye, but only Cat 3 winds around the high pressure, thus the Cat 3 rating. Thanks guys. You do so much for my sanity in post-Harvey Houston. We appreciate you! I just hope you are right. I’m get sick of having to deal with 1-2″ of rain EVERY FREAKIN’ MORNING THIS WEEK on my way out the door or on my commute. Oh, yes, it’s RAINING right now! When I called to ask why there was no spraying, I was told it was because of the rain. The ones around here are going straight through the DEET. My daughter’s wedding is tomorrow, they plan to leave to Jaimica for their honeymoon Monday morning, good or bad? Thanks for the no hype information ! Excellent form of giving the “NO” hype weather, so wonderful and extremely needed. Thanks for the update, I follow y’all’s posts daily! StIlL rAiNiNg MaKe It StOp !!!! Not much sleep with thunder and nervous dogs. Hope tonight is better. Thanks for the great reporting. It has been super fun on the Island today…. thankfully we are dry here at the Community Center, and people are heeding the high water warnings and driving slowly in the No Wake zones (for the most part). Hopefully low tide will help all this water drain… is the heavy rain done for now? Can you speak to the accuracy of the cmc ensemble? It has Isaac hitting Houston in 6 days! Ha ha, love Star Trek! Do freeways play a role in storms? I know it sounds like a crazy idea, but my whole life I have seen storms going strong till they go past a major road and then they fizzle out so fast. You always hear “north of I-10” or “south of 59”, why do storms seem to stop when they go past a large road? I seem to live in the wrong corner because none of the rain comes to me. I can drive 2 minutes in either direction (to the large roads) and it’s raining there, but it isn’t at my house. Of course they play a role around Houston. They get slowed down by the traffic just as much as you and I do. Eric, how much accuracy do you give to the CFC model ensembles vs. GFS and EURO? The latter has the remnants of Isaac heading into central america, while the CFC shows a tropical storm coming near Houston next week. As of tonight, the global/hurricane models are in sync for Texas! Hope you’re right. I will add that link to my favorites (I already monitor 10 sites) but my NOAA contact insist that predictions more than 5-7 days out are not accurate (I asked about it because of a discrepancy between WPC and Weather Channel). 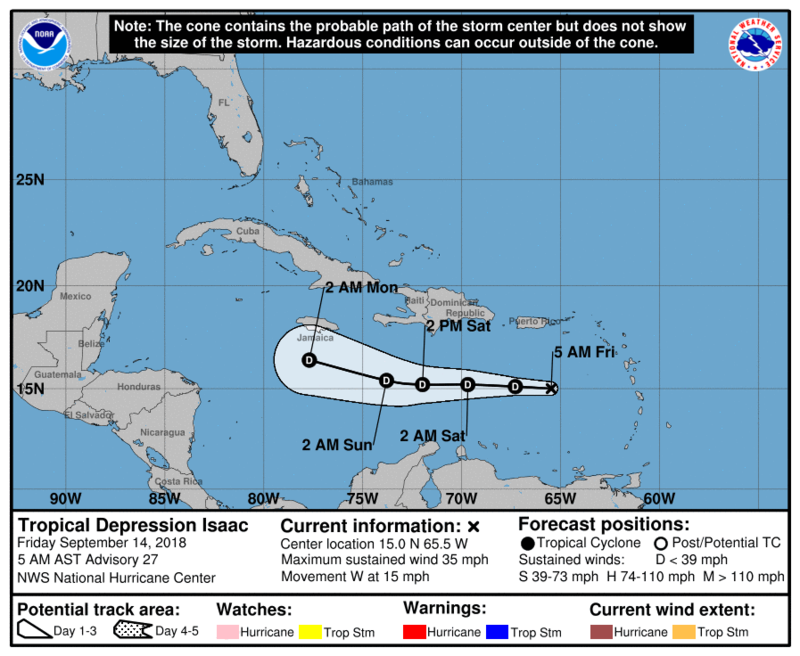 How can your contact’s “predictions” be right when none of the 5 day forecasts show anything even close to resembling Isaac in the area? Calm Down People: it’s hard to calm down when you had 13 feet of water at your house from Harvey. Yes, my house was essentially in a Lake. And you still live in a trailer in your driveway because you couldn’t get a contractor. So you will have to excuse some of us if we are skittish about the tropics while we are still repairing our house from last year’s tropical event.